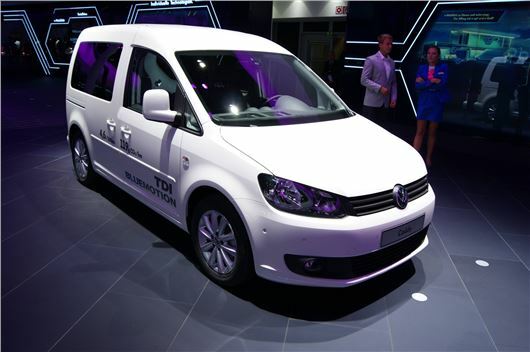 Volkswagen officially launched the new Caddy BlueMotion at the Frankfurt Motor Show. Powered by Volkswagen's 1.6 TDI engine it's even more economical than the Caddy with BlueMotion Technology and can average 62.8mpg according to the official figures with CO2 emissions of 117g/km. With a 60 litre fuel tank that gives the Caddy a theoretical range of more than 800 miles. Yet despite this economy, the engine still has decent power with 102PS and 250Nm of torque. The improvements are made possible by aerodynamic tweaks including a lower ride height, an engine start/stop function, low rolling resistance tyres and brake energy recuperation. The Caddy BlueMotion with a short wheelbase is available in four versions: as a panel van and kombi as well as in passenger-carrying versions. Standard equipment includes hill hold assist, cruise control, special seat upholstery and air vent surrounds in high-gloss black.